Online marketplaces have mostly overtaken brick and mortar stores as the preferred shopping experience in the US, but there’s a major drawback for some consumers: Package theft. SafeWise, an independent home security systems review organization, reported on the Top 10 metro areas most likely to get hit by porch pirates; Miami and Tampa both made the list for Florida. With this news and package theft on the rise, more homeowners are taking action. They’re installing cameras, security alarm systems, automatic timers, and other technology to protect themselves. Of course, this increased security also means you’re more likely to get caught, and the proof against you may be overwhelming. 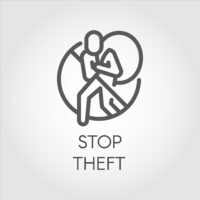 There are strategies to defend yourself, however, and a Florida theft crimes defense attorney can help. An overview of the potential charges and penalties may be useful to understanding what you’re up against. Florida law classifies these types of crimes by the value of the items that are stolen or misappropriated. It’s considered petit theft to take property between $100-$300, so you could be arrested for a First Degree Misdemeanor. For a conviction, you may be looking at up to one year in jail and a fine up to $1,000. These penalties increase if you have a prior history, and the crime may be elevated to a felony if you’ve been convicted on two or more theft crimes in the past. For property valued above $300, felony charges may apply; in addition, you could face a felony depending upon the type of property. Because you’re not likely to know what’s inside a package lying on a porch, you may not know the severity of the crime until you open it – or are arrested by police. You could also be arrested for a burglary crime, which isn’t a theft offense at all under Florida law. Burglary is illegally entering a structure or dwelling with the intent to commit a crime. Even if you don’t take the package, police may have grounds to charge you with burglary. Unlike theft crimes, burglary is always a felony. For a Third Degree Felony, you could be sentenced to five years in prison and a maximum fine of $5,000. By definition, a porch pirate is interfering with the US mail, which is a federal crime. It doesn’t matter how much the items in the package are worth, and you don’t even need to complete the crime to be arrested: Under some circumstances, an attempt could still be a federal offense if you leave the package behind. If convicted for theft of US mail, you could face up to five years in federal prison and a $250,000 fine. There are defense strategies available for porch pirates, especially since security cameras often provide grainy, blurry video evidence. If you were arrested for a theft crime or similar offense, please contact attorney Kevin J. Kulik to schedule a confidential consultation at our Fort Lauderdale office. We can review your situation and determine defense options.